Last weekend, I came across a large turtle in my yard. It was a red eared slider and she was beautiful! I'm not sure what she was doing here, but we do live across the street from a park with a lake in it. She looked nice and healthy and I thought she might enjoy it if she were returned to a place where she could swim freely. Here's a picture of the turtle we found. 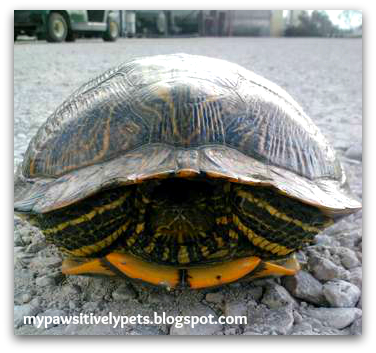 Red eared sliders are a semi-aquatic turtle that are native to the Southern United States. They are probably one of the most popular turtles kept as pets. They get their names for the red markings around their ears. The name "slider" comes from the way they slide off of rocks or logs when threats approach them. You can see the red markings on the side of this red eared slider's head. 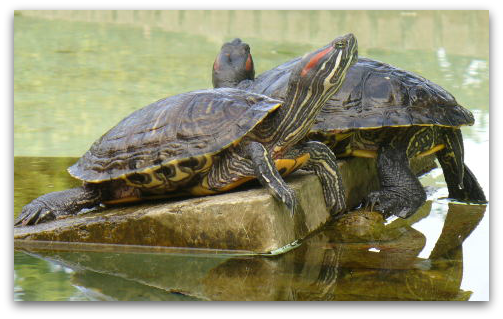 Red eared sliders are actually found all over the world. Many populations of red eared sliders in places like Australia and England are an invasive species. Sadly, they do not belong in these places. They were released there by people who kept them as pets. Because of this, there are many laws and regulations on the sale, trade, and import of red eared sliders around the world. In America, the FDA bans the sale of red eared slider turtle eggs and turtles with a carapace that is less than 4 inches in diameter. Pet stores have found a loophole in this regulation though. There is an exception to the law that says that these turtles with a carapace less than 4 inches in diameter can be sold for scientific, exhibition, or educational purposes, other than use as pets. I've never seen a turtle before, that video was pretty cool! Good job for setting her/him free and happy! :-D Whoosh! That's sad about the loop hole! Yea, it is sad. I've seen a lot of red eared sliders who were no larger than an inch. Most of the time they were sick. Happy turtle , swim free. We had some dumped in our park pond for a number of years. Have a fabulous Friday. There is always something in our yard! Possums, skunks, snakes, frogs, lizards, armadillos, raccoons.... all kinds of things! That turtle was sure Happy Together to get back into the water. Get it? That's the name of a Tutles' song! In NYC it's criminal how they sell turtles out in the hot sun all summer. aww what a nice little deed you guys did, Im sure the RES turtle appreciated it! That would be awesome Sugar! Thanks for doing such a good deed. We enjoyed watching the turtle return to happy waters. Hey Jet. It's probably what you guys are seeing, but who knows could be something different! turtles are so cool and you were so sweet to help it head back home. Thanks for the info too, I had no idea.